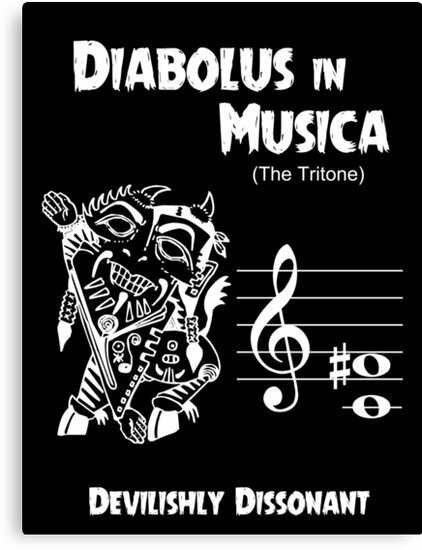 Hi and welcome to the final Halloween installment this week, all about the tritone, or as it was often called in the past, “the devil in music”. This is a tone that has offended people for centuries, though our modern ears are much more desensitised to it. C to F# is a tritone, because the distance between each of the notes is a whole step (a half step is the shortest distance between two notes, such as C to C# – a whole step is two half steps). So A – D# is a tritone. So you know how you can have major and minor chords and intervals? There are also intervals with names like ‘augmented’ and ‘diminished’ – augmented simply means the tone is raised a semitone, and diminished means it’s lowered a semitone. But it means the exact same thing, and it sounds the same – super creepy. The tritone was avoided in the middle ages and renaissance as being difficult to sing and very unpleasant – western music of the time was mainly spiritual in nature, so why would you use these incredibly discordant sounds when praising god? It just didn’t make sense to people. “The devil in music” started to be used more in Baroque and Classical music, but in a very controlled way. A tritone was used to create tension, but the tension was almost always relieved by a complimentary tone, or something that sounds relaxing and pleasant. Once the romantic and 20th century eras rolled around in music, composers started using these tones more freely – and maybe almost a little too freely, because somewhere in the twentieth century, it was used so much that the effect is mainly lost on us now. I mean, sure, when we hear the Jaws theme it’s ominous and all, but I don’t think it’s as soul-shatteringly ominous as it might have been 500 years ago. Times have changed, and with it, so has our sensitivity to certain musical sounds. Some modern examples of tritones can be found in many Black Sabbath songs, as well as the very first few notes of Jimmy Hendrix’s Purple Haze. And with that said, I hope you’ve enjoyed today’s trip into the tritone, what used to be affectionately referred to as the Devil in Music because of how freaky it sounds. Thanks for watching, and happy Halloween!